DraftKings and FanDuel scrutinized for insider info after employee leak, win. 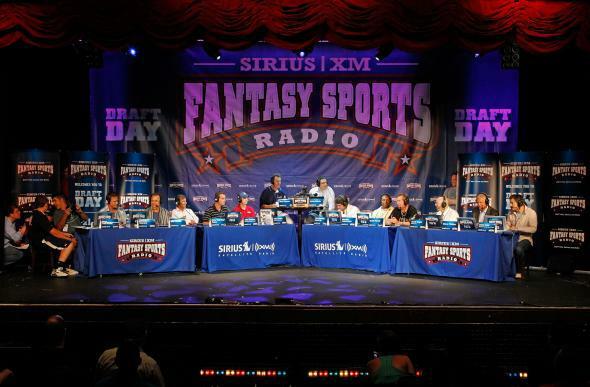 A celebrity fantasy football draft at Hard Rock Cafe in 2010. The multi-billion dollar fantasy sports industry came under increased scrutiny Monday after an employee of DraftKings, one of the two major daily fantasy gaming sites, was found to have inadvertently released data that could have given certain players an advantage and raised questions about who has access to the internal data at each company and how it could be used to unfairly tilt the odds in a particular person’s favor. An individual who has access to data on which players have been selected by other contestants, while not sure to win by any stretch, could use that to select less favored players, which if they had a high scoring game, could give the fantasy owner a significant advantage. While it might sound like a small error among friends, the daily games at DraftKings and its rival FanDuel, offer purses from contestants entry fees that now reach into the millions of dollars. On Monday, both companies barred employees from participating in competitions on other sites, according the New York Times, as they tried to reassure customers of the integrity of their games. “DraftKings and FanDuel posted on their sites an unusual joint statement saying they have no evidence anyone misused information for profit,” the Associated Press reports. “The broader issue is whether players who put up entry fees to try and win money in the contests can be sure that insiders — or anyone else — is getting an unfair advantage.” The fantasy gaming industry managed to escape regulatory oversight when first established because the contests were deemed games of skill, not chance, and are legal in all but five states. “But because Congress did not foresee how fantasy sports would explode, one member, Representative Frank Pallone Jr., Democrat of New Jersey, recently requested a hearing to explore the relationship between fantasy sports and gambling,” the Times reports.